The UAC has moved NW, and is in a more Northern position than expected at 17N off the AP coast. Now in the Bay is moving towards the AP coast, inland, and is strong at 850 mb, but decreasing with height. Tracking Westwards. The mid level wind shear, the level of the UAC, is tilting towards the NW, and is dragging the main wind shear towards the central region of the system. This could have been expected, as now upper level winds are high over the Northern Peninsula regions. Precipitation is good in the coastal AP and Orissa and some interior regions. Bhubaneshwar got 44 mms and Kurnool received 32 mms till 5.30 pm Saturday. Naturally, the winds over Chennai will be W/NW, due to its N/NE location, even though the system is not at sea level. Winds have kept humidity comparatively low in the day, and could have prevented precipitation. With moisture increasing, we can expect more clouding to cover the Southern and SE quadrant soon. In other words, precipitation over Chennai region is possible as expected on Saturday late evening (now maybe night)..
Precipitation over Chennai region can be expected from Saturday night. SWM would withdraw from Kutch and Punjab on Sunday, 8th September. 1. 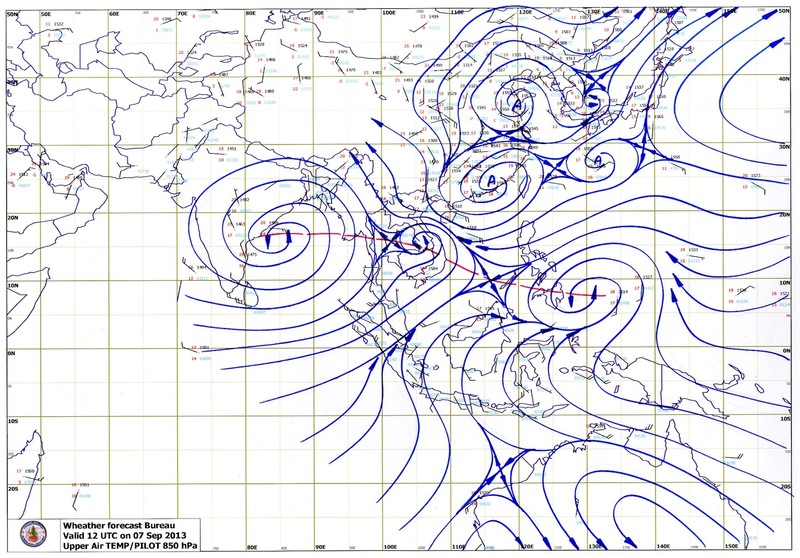 A North-South trough runs in the Bay, along the 85E line, away from the East Coast of India. A UAC is embedded in the trough, thus strengthening it. The UAC is currently situated in the Mid Sea off the North TN/AP coast. UAC may descend, or as an UAC, cross the North TN coast on Saturday. (Will be numbered if it is on sea level). 2. The System will track Westwards on Sunday, and should be located around Bangalore. Expected to move W/NW on Monday. As of today, track is Thru Interior Karnataka and re-emerge in Arabian Sea as an UAC off the Goa coast. For the weekend, Medium to heavy Rainfall Cities: Chennai, Vellore, Bangalore and Davanagere. Goa can expect heavy rains on Sunday night and a cloudy and rainy Monday. Chennai: Rains on Saturday evening, but increasing on Sunday. Sunday will be cloudy with occasional showers and rain amounting to around 40 mms. Mumbai: Saturday and Sunday will continue with current weather conditions. Maintaining earlier statement, increase in rainfall (thunder showers) after Monday or Tuesday (9th/10th September). Pune weekend same, but substantial increase from next week. Can expect around 75 mms next (whole) week. Last Date for Monsoon Contest Entries TODAY. Moderate to heavy rains lashing Goa since early morning. This after nil/trace rains from September 1 to 6. Intensity decreasing at the time of posting this comment! Looks like Mumbai might get a strong thunderstorm on tuesday and wednesday. No rains in Hyderabad since 15-Aug. Any chances of rains next week ? Moshin: The UAC or Low will go west and as explained move into Arabian Sea thru Goa. But, then there are no chances of strengthening, but will go weak and vanish. sam: Vagaries has mentioned the SWM withdrawal from more parts of India, that is Punjab and Kutch on Sunday. The reasoning is a high pressure will form in that region. Now, if the high pressure gains in strength, then we may see North winds (in Mumbai also) pushing and keeping the cirrent system below the 15N line. It may even lessen the rain effect over Mumbai...shall observe and post tonite again. Dattaraj: Yes, i think Hyd will get rain from the UAC crossing the TN/AP coast. Most effects of medium rains on Sunday when 25 mms can be expected..
Atul: yes, i see good rains this weekend in Goa ..
i think as pridicted arabian sea also pop up circulation in october it became cyclone...what abt your pridiction...weakend forcast for mumbai..
moshinbhai: weekend prediction is in this article itself ! sudharshan: Chennai will be cloudy with occasional rain showers on Sunday...but as system is moving more northwards than expected, amount may be less than forecasted. current low benifited mumbai or kokan for revivial of monsoon.low will hit mumbai from arabia dea through goa...what abt your pridiction. South low seems has dissipated quickly - disintegration seems to have resulted in clouds over Orissa, south west Arabian sea(this may result more rain in Konkan), interior MAHA. Was expecting around 200-300mm of rain in 24hrs. Chennai got just 2-5mm of rain. BANG-10mm of rain! Tirupathi- 0mm (water crisis). the uac formed in the south east arabian sea will hit the sothern konkan and goa and cause moderate to heavy spells of rain ther.morth konkan and mumbai can experience light to moderate rain there on 10 th evening and 11th august.this may not last for a longer time. S chennai getting super rains..